The team behind a Lord of the Rings project nine times larger than Skyrim is seeking to overturn its cease-and-desist order. It's a timeless story that's been told throughout the ages. Boy loves movie, boy tries to recreate beloved movie as a videogame modification, and finally, IP holders issue a cease-and-desist order preventing the modification from being released. We've all been there. But one Skyrim modding team believes that its Lord of the Rings project is unique enough to warrant an exception from the legal banhammer, and has started a petition and boycott in the hopes that Warner Bros. will change its mind. The mod in question is a meticulously detailed recreation of Middle Earth nine times larger than Skyrim that includes all of the characters, locations, and even quests depicted in the films and books. Yes, even the crucial quest of Frodo the Ringbearer. "[The Middle-Earth Roleplaying Project] is a Lord of the Rings total conversion for The Elder Scrolls V: Skyrim made, non for profit, by volunteers in their spare time," the petition reads. "We, the undersigned, call upon Warner Bros. Entertainment to lift the cease and desist from MERP and allow the developers to continue as they were with no hindrance. Until the above solution is reached, the undersigned promise to boycott and refrain from purchasing any Lord of the Rings branded products that Warner Bros publish or support." MERP began production in 2008 as an Oblivion mod that, before the cease-and-desist order, was in the process of being ported and expanded within Skyrim. While the Skyrim port was still in the early stages, planned features would include a heightmap 9 times bigger than Skyrim, quests from the White Council and Free Peoples, and even the ability to keep the One Ring for yourself instead of hurling it into Mount Doom. The MERP team actually started a dialogue with the Warner Bros. legal team to protect what had been developed so far, offering to cut features and quests that might conflict with commercial LotR projects, but were routed at every turn. 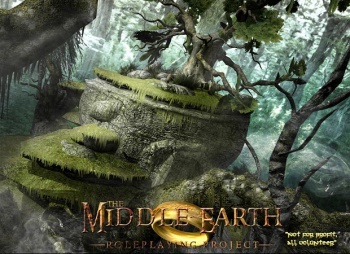 "From the description of [the Middle-Earth Roleplaying Project] available publicly, we understand that it essentially amounts to a LOTR game," reads the cease-and-desist order from Warner Bros. "The release of MERP into the marketplace will likely result in customer confusion and cannibalization with respect to such legitimately licensed LOTR/Hobbit games and will detract from the value proposition bargained and paid for by legitimate licensees of the LOTR/Hobbit properties. Furthermore, projects and games like MERP will diminish and erode Warner Bros.' ability to manage and protect the brand, reputation and quality of the LOTR/Hobbit properties that it has invested significant resources to cultivate over the years." In all honesty, it is exceedingly unlikely that a petition or boycott will have the impact that the MERP team hopes it will. With the Hobbit movies set to exponentially increase the Lord of the Rings audience, this petition will need an astounding amount of support before Warner Bros. will take notice, and naming your petition "Save MERP from corporate greed" isn't going to help. That said, a strictly non-profit modification might get a pass if the petition gets the attention of someone outside of Warner Bros. Legal Department. The petition has gained over 3000 signatures in the two days since it was issued. Anyone interested in signing the petition can find it here, while the Oblivion version of the mod is (currently) still available on Moddb.